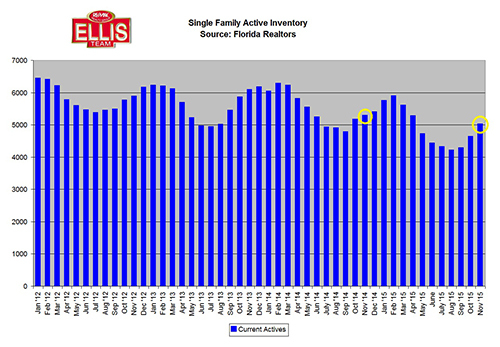 SW Florida closed sales for single family homes fell in November 6.7% in SW Florida. Many are blaming new Federal guidelines known as TRID for delayed or cancelled closings, and there may be some truth to that. However, a deeper look inside the numbers presents another theory as well. Cash sales also fell 12% in November. Cash sales were not affected by the new rules, so this would dispel the idea that the entire slowdown was caused by delayed closings caused by TRID. 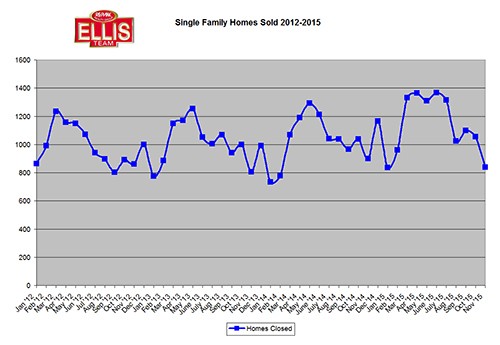 It could very well be there are fewer closings because there is less active inventory to sell. Active single family home inventory fell 5.1% in November, down to 5,010 listings as compared to 5,277 available last year. It’s hard to keep losing inventory each month and expect closed sales to rise. Statistically it can’t happen forever, and this is why it’s putting pressure on prices to rise. And rise they have! Before we look at prices, there is some good news on the inventory front. New listings rose 10.7% in November. 1,661 new listings came in this year compared to only 1,500 last year. We are seeing more listings hitting the market, so why aren’t inventory levels rising? New pending sales fell in November 4.4% There were 1,104 new pending sales this year compared to 1,155 last year. If 1,661 new listings came on the market, and only 1,104 went pending, how did inventory levels fall in November? The answer is convoluted. Not all pending sales close. Not all pending sales close in the month they go pending as there is a lag. And not all closings are happening on their scheduled contract closing date. Closings are being delayed by TRID and banking delays. Additionally, some listings expire and don’t go pending which also drops inventory levels. Sellers with expired listings need to make difficult choices. Did they hire the wrong Realtor? Does their home need repairs? Or did they simply overprice the market? Sometimes it’s good to step back and objectively look at what other sellers are offering and at what price. That is your current competition. It’s also important to look at sellers who won the home selling game. What condition was the property in? Did that property receive updates? How was it priced? Many times the answer is staring sellers right n the face, and it’s right there if they want to look at it. Buyers have similar decisions to make. Often we hear from buyers who have lost out on many homes for various reasons. Quite often they’re being outbid by other buyers. If you keep offering 10% off asking price expecting to win a home you have about as much chance as a seller overpricing their home by 10%. The market is the market, and when you price a home correctly, it will sell. When you bid for a home correctly, you have a chance. We’re not saying you have a guarantee as sellers evaluate the entire offer and compare it against other offers, or potential future offers. Sellers look at how much you have in escrow, how confident they are in the lender you chose and the details in your pre-approval letter. They look at how much you’re putting down, and if it’s not a lot how you would overcome your bank appraising the property low. Buyers typically say a low appraisal is the seller’s problem, and it may be. But it also can be the buyer’s problem as many sellers turn down low appraisals and sell their home to cash buyers the next week. This is of course if their home was priced correctly in the first place, as cash buyers don’t like to over-pay anymore than financed buyers do. The bottom line is it pays to research the market, and work with an expert. Experts can help you navigate the process of how much to offer, battling low appraisals, and overall market statistics. If you’d like to do a little research yourself, check out www.LeeCountyOnline.com and search the MLS. If you’d like to talk to local experts, call us at 239-489-4042 and we’ll see if we can help. Posted in Bella Casa, Cape Coral, Cape Coral Real Estate, Fort Myers, Fort Myers Real Estate, Southwest Florida Real Estate.Tagged TRID.